What more could you ask for on Valentine's Day? To celebrate Valentine's Day, Sony has released a new trailer for SIE Bend Studio's upcoming open-world zombie shooter, Days Gone. We've seen plenty of footage taking place after everything has gone to sh*t, but this is the first we're seeing of protagonist, Deacon St. John before the effects of the global pandemic. 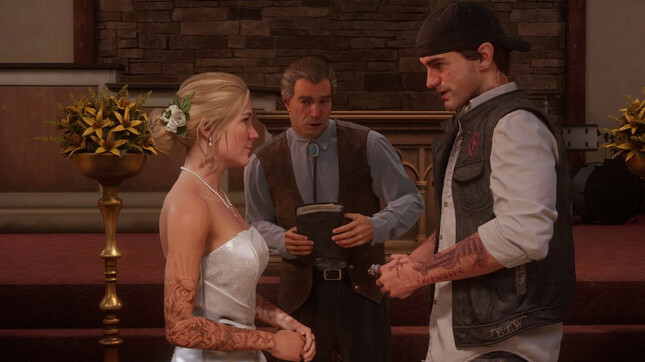 We're treated to the harsh juxtaposition between the two separate times, as the trailer cuts back and forth between Sarah and Deacons wedding day and Deacon standing in the now destroyed church, holding a photo of his wife. I'm going to go and assume this poor lady meets an early demise, thus propelling Deacon and players into the harsh reality of the new world they'll have to fight to survive in. It's great to finally see some effective emotional beats and what will likely be the jumping off point for Deacons harrowing journey. Days Gone is easily one of our most anticipated games this year and these trailers are further solidifying it as a must-play title when it release exclusively on Days Gone]PlayStation 4 on April 26[/url].